The 1700 slave ship Henrietta Marie mounted eight cast-iron cannon, and these guns fired solid, cast-iron, round shot. 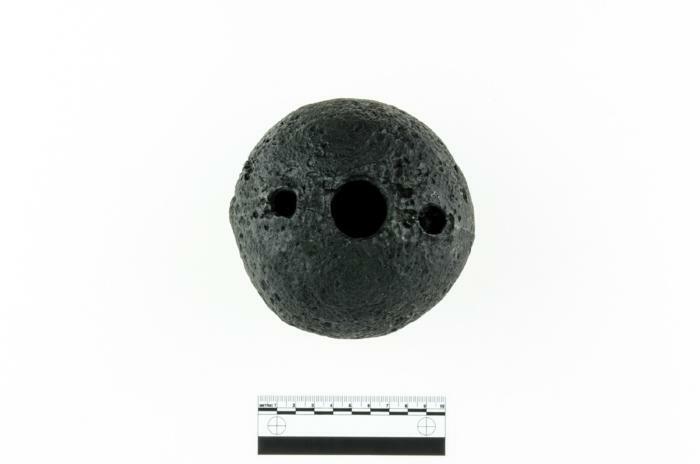 Approximately 75% of the shot recovered from the wreck site are three-pounders, with the remainder being four-pound size. In general, the smaller are approximately 2 ¾ inches, and the larger have a diameter of 3 ¼ inches. These iron balls could be fired with a point-blank range of 150 yards and a maximum range of around 1500 yards. The impact of these solid shot would allow them to damage an enemy ship, while maiming or killing those on board. One example of “barshot” also comes from the wreck. This piece consists of two round shot joined by a short iron bar. This piece was to be fired from the cannons just like the other shot. It was designed, though, to whirl through the air and cut a greater swath than a simple ball would. Barshot was especially effective at destroying rigging and sails, but it could kill more effectively, too. Falconer, William (1780). Falconer’s Marine Dictionary. T. Cadell, London. Page 109.